Ornamental sweet potatoes are grown for their beautifully colored foliage that will accent any garden when used as an annual ground cover, or cascading over rocks, walls, containers, and hanging baskets. The ornamental sweet potato (Ipomoea batatas) is a favorite annual for many adding colorful foliage as low growing bedding plants, summer ground cover, cascading plants over walls, hanging baskets, and containers. Both the ornamental sweet potato plant and those grown as an edible vegetable are from the same family but the ornamental sweet potato has been bred to maximize the beauty and color of the leaves as well as the size and shape of the plant. While it does produce edible sweet potato tubers they are not very palatable and are extremely bitter. The ornamental varieties of sweet potatoes bear more colorful foliage, making it very popular in gardens, containers, and as a house plant. Once planted in the garden or containers, after the temperatures warm up in spring, these beautiful plants will continue to add color through summer and fall until the first frost. Not too many years ago there were only a few cultivars available. Since then the number of cultivars has tripled with varying leaf shapes and colors making the ornamental sweet potatoes a wonderful addition to any landscape, garden, or container garden design. The ornamental sweet potato with their many leaf shapes and colors now available not only make a huge impact by themselves in gardens and containers but make a wonderful companion plant to other sun and heat loving plants. The sweet potato accents many plants such as coleus, cordyline, begonia, petunias, ornamental grasses, verbena, zinnias, and many other annuals that are heat tolerant. The chartreuse colored Marguerite (Margarita) cultivar is still my favorite sweet potato vine although it can spread to 6 or 8 feet and does at times need some pruning to keep within bounds. Its bright color is a great contrast with most of my other flowering annuals. The addition of cultivars such as the Sweet Carolina series that are slower growing and more compact gives the home gardener greater creativity when using the sweet potato in small gardens and small to medium size containers. The Sweet Caroline Sweetheart series (with heart-shaped leaves) is available in light green, red and purple, while the stand-alone Bewitched variety has maple-leaf-shaped, purplish-black foliage. The Sidekick series is available in black and lime colors with different leaf shapes. The lime-colored variety is lighter in color than the chartreuse-lime green foliage of Margarita, and the growth habit is low-growing and less spreading. Another series that is quite unique is the new Illusion series from Proven Winners. They have thread-leaf foliage and are smaller-growing and much less vigorous than any of the others. Illusion is available as Emerald Lace, Midnight Lace and Garnet Lace. Although the ornamental sweet potato is grown mainly for their colorful foliage you may see some flowers appear towards the end of summer. The only cultivar that has flowered in my garden is 'Blackie'. The lavender flower is nice against the dark foliage but rarely seen as the flowers are usually deep within the plant and covered by the outer leaves. Select Your Ornamental Sweet Potato. 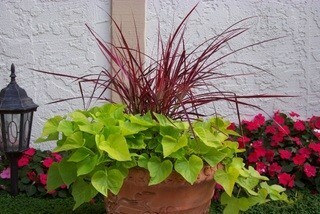 Select plants that appear to be more com­pact, nicely colored, pest free, and have no leaf damage. 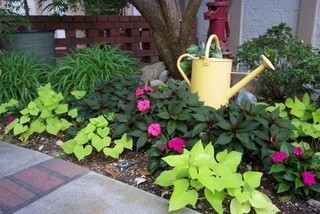 The plants should fill out the container but not be overgrown. Pick plants that have leaves close together on the stem. If plants were grown in a green house or shady location, the color may not be fully developed, but that will not affect their ultimate performance. You may see a small amount of leaf scorch from the direct sunlight if the plants had just come out of a shaded greenhouse. Neither of these things will affect the plant in your garden. Inspect the plant for any of the following indica­tions of insect or disease problems. If any of these are seen don’t take the plants home, as these problems could spread to other plants in your garden. Ornamental sweet potatoes are normally grown as annuals as they are not cold hardy. Plant them after the last frost date for your area. A soil pH of 6.0 to 6.5 is best, but they will perform well in a large range of soil pH levels. Orna­mental sweet potatoes perform best in full sun. They can tolerate light shade, but the colors may become less intense and gain a green tinge. They will grow well until the first hard freeze, which will kill back the tops. The roots may survive the first frost but will not live through the winter. Sweet potatoes need a well-draining soil amended with plenty of organic mat­ter. Monthly applications of water-soluble fertilizer will enhance growth. When planting an entire bed with ornamental sweet potatoes, space the vigorous variet­ies 3 to 6 feet apart, as they will fill in the area quickly. Medium-size plants should be spaced 2 to 4 feet apart, and slow-growing or clumping varieties should be placed 1 to 2 feet apart. Keep soil moist but never too wet or dry. Water thoroughly and allow the plants to dry slightly between watering, but avoid allowing the plants to wilt, which can result in leaf loss. Also avoid excessive watering as this can cause root rot and fungal disease. Monthly applications of water-soluble fertilizer will enhance growth and leaf coloring. If your plants grow out of bounds, you can prune them hard and they will recover quickly.